Chances are, you missed National Pig Pickin’ Day for the year 2013 and… it’s all my fault. You should know that May is National BBQ Month but if you don’t, I’m sorry, I can’t accept responsibility for that one. I will however take full blame for the fact that you may not have been eating any BBQ on May 18, 2013. Let me explain. 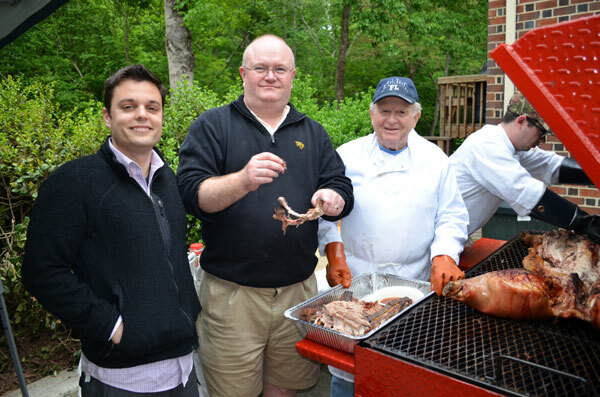 The very first Official National Pig Pickin’ Day was held on May 18, 2013… a day that will go down in BBQ history. You probably missed it this year and, if you did, its all MY fault. I totally accept full responsibility for you missing out on this special event and, to make matters worse, it was indeed the very FIRST one ever held in the whole wide world. But, take heart, all is not lost on this day. I can gladly say that the very First and Official “National Pig Pickin’ Day” Event went off very well. Any National type event has to start off somewhere… right? 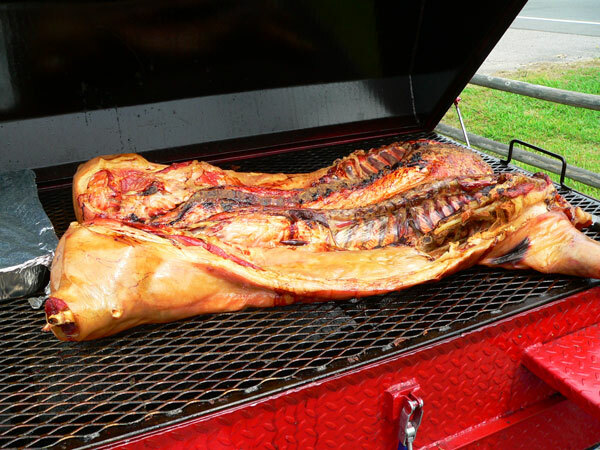 The very first National Pig Pickin’ Day event was held this past Saturday, May 18, 2013 in Sanford, North Carolina. Sanford is situated in Lee County, better known as the heart of North Carolina. We’re a growing community, conveniently located to Raleigh-Durham, Chapel Hill, Greensboro, Southern Pines, Fayetteville and Gulf, NC. Gulf is a much smaller community where country singer and musician Charlie Daniels first learned how to play guitar. I’m proud to say I know the man that taught him and, the lady that claims to have sold him his first guitar. But more about National Pig Pickin’ Day 2013. Back at the first of the year, I had this great idea to put on a BBQ Cooking Competition in our area based on the fact that my brother sells one of the best pig cookers you’ll find anywhere. He’s sold over 1600 of them in the past few years and they’re all handcrafted right here in North Carolina and, made to last a lifetime. 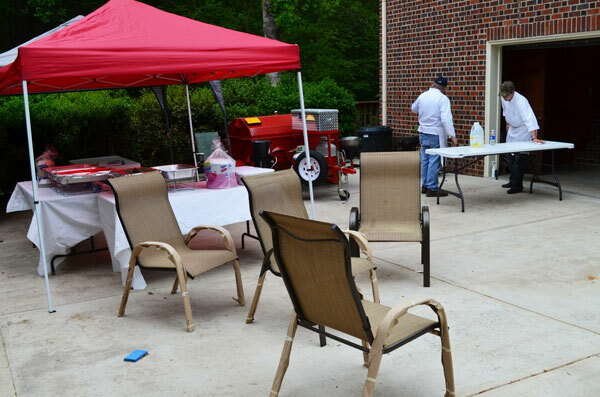 The plan was to host this BBQ Cookoff and invite the owners of the Carolina Pig Cooker to participate. 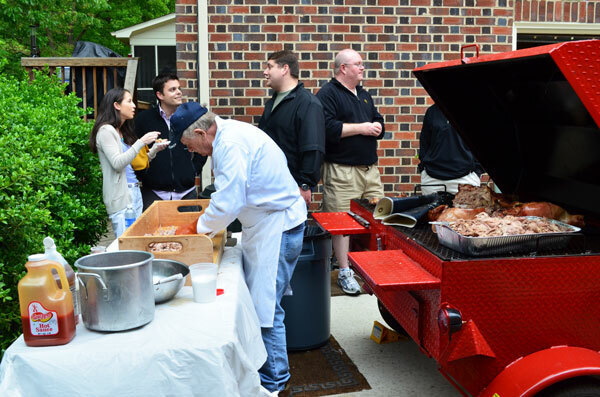 We’d do it just to have some fun with the owners of the grills and also as a fundraiser event for Family Promise which helps provide shelter for the homeless. About 10 churches in our area participate in Family Promise and like most non-profits, they can always use some extra funds. A family that has lost a home, for whatever reason, can spend one week in each of the 10 churches that provide shelter, warm food and lots of encouragement so, hopefully by the end of the ten weeks, the family will have saved up enough money to get back into a home. It’s a good program and my brothers church participates in it. I shared the idea with my brother and how we could bring many of the Carolina Pig Cooker grill owners together for some fun, fellowship and a little friendly competition. We’d get at least 10 of them together, provide them each with a pig to cook, judge one as the best, chop up all the pig and make BBQ then, we’d sell plates until it was all gone. Easy huh? Well, we kind of thought so at first but, the more we dived into it, the more we realized, we just didn’t have enough time to properly pull it off by May 18th, the date I had determined would become National Pig Pickin’ Day. I had selected a day in May because the entire month of May is already recognized as National BBQ Month anyway. It just seemed like a logical fit for it. The more excited we got about the idea, the more we realized that we might should put it off until the fall of this year. So, we’ve set the month of October as a time to hold the BBQ Competition and plate sale. Now, we just have to really get busy and make it happen. However, we couldn’t just let May 18th pass us by without doing something. Afterall, it had already been declared National Pig Pickin’ Day. The local auction house that I attend almost every Friday and Saturday night had been asking me about having a pig picking as a promotion for the auction house. I approached the owner about doing a fundraiser plate sale at his place of business on the official day set aside as National Pig Pickin’ Day and… as they say… the rest is now history. I have the picture to prove it. No, that’s not a typo, its meant to be singular because ONE PICTURE is all I managed to get to prove we actually did celebrate National Pig Pickin’ Day. Three weekends ago, Carolina Pig Cookers was asked to throw a real Southern style Pig Picking at the home of an attorney in Charlotte, NC. His name is Jim and he wanted to invite 100 guests to his house for his annual party. Seems he lives right on the golf course down that way and, they were hosting the Wells Fargo PGA Tournament that weekend. So, my brother, my nephew-by-marriage and, yours truly, packed up the gear and headed to Charlotte to cook some pig for the pig picking. We travelled about three hours and having visited the site, made some last minute shopping and, picked up some boxed chicken for supper, we settled down in our hotel room just about midnight. We all tried to get some sleep about 1:00am but didn’t have much luck with it. We were all back up at 4:00am and at Jim’s house with the pig on the cooker and cooking at 5:05am. It takes a long time to slow cook a pig. It was still dark and we started unpacking for the day. The photo above was taken around noon time as my brother and Wren began setting up the serving area. Guests would start arriving around 5:00pm. 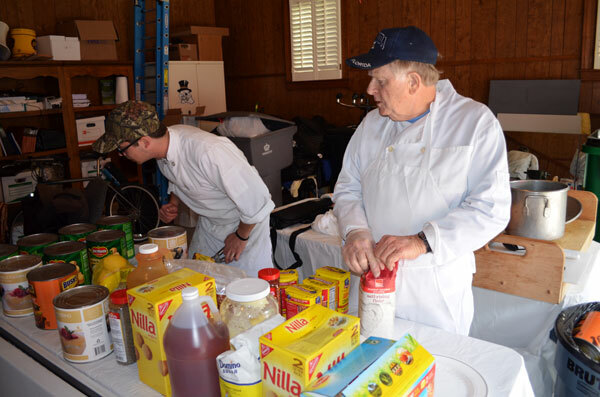 Wren, on the left and, my brother, pictured here on the right, began prepping the food for the day. My whole purpose in being there was pretty much the driver and photographer. You see, I wanted to take full step-by-step photos and some video of how to cook a pig on one of the Carolina Pig Cooker grills. I got up at 4:00am to drive everyone else back over to the work site and, I had planned to go back to the hotel room once the pig was placed on the grill and take a shower for the day. But then, we discovered we needed another item or two and I ended up driving my brother over to one of those big box stores. There really wasn’t anything for me to do at that particular time so I offered to drive for him. I’m just that kind of guy. We got back around 10:00am and I took a couple of pictures of the work in progress. We shot a little video about the pig and I was about ready to go back to the hotel room for that shower. As it turns out, Wren had decided he’d like to get back home that night as opposed to us staying over night as had originally been planned. We all agreed that it would be fine so, I headed back to the hotel room to collect our things, shower and, check us out by 11:00am. It was 10:45 by the time I got back to the room but, the very nice desk clerk lady gave me another hour to grab that shower and get us all packed and checked out. Arriving back at the catering site, work was moving along on prepping all the food for the day. Wren had been busy chopping Bell Peppers, Onions and slicing some Bacon for the Baked Beans while my brother had been working on his famous BBQ Sauce and some other goodies for the pig. It was approaching 1:00pm by now and I was informed that the crew had saved the making of the Banana Pudding for me. I already kind of knew that since my brother had first mentioned that Jim had requested we serve Banana Pudding for dessert that evening. The original plan was to try and use the hosts kitchen to make Banana Pudding from scratch with a cooked custard and egg white meringue topping but, we had to abandon that and go for the regular catering version instead. Around 3:30pm, my brother called Jim over to give the now cooked pig a taste test. That’s Jim with the big smile and a couple of ribs in his hand. I’m sorry but I don’t remember the name of the guest on the left. Jim gave his full approval to the pig taste test and with that… the party was on. Once Jim tried another rib or two, my brother went into action and started chopping up the BBQ. This is his specialty and, in about an hour, he had it all chopped up, sauced up and ready to be served. You can see Jim in the background and a couple of the guests that milled around the cooker while the work continued. I had completed making my two large pans of Banana Pudding while Wren had all the other items ready and was setting up the serving area. We were right on schedule and the first of the guests gathered under our tent to fill up their plates. I just need to say that Jim and all of his family and friends were one of the nicest bunch of folks we have ever worked for. We were pretty well give out tired by this time but, the guests boosted our moral and spirits with all of their kind and gracious compliments. They could have treated us like the hired help we were but, instead, they all came over to talk with us about the food, pig pickings in general and made us feel like part of the family. It was Awesome! Thank you Jim and to all your friends as well. You made us very happy and it was a pleasure to have been a part of the experience. We monitored our buffet line until around 7:00pm, moved the remaining food over to one of Jims tables and by 7:30pm, Wren and I were sitting in the packed truck waiting for my brother to wrap things up with Jim. Jim came out to the truck to speak to Wren and myself and, then he made us all promise that we would come back next year and do it all again. How cool is that? We were all exhausted after such a long day and still running on just a few hours overnight sleep. I knew that my brother and Wren were counting on me now to get us back home safe and sound. We pulled out tired but happy and, feeling as good as we could about all the great compliments we had received that evening and just settled back for the ride home. I got Wren home about 12:00 midnight and I got home about 12:30. My brother had to drive himself home from my house and it was about 1:00am he said before he got into bed. Now, the point of this story is that I was suppose to take pictures. I wanted to use the pictures to setup a recipe for National Pig Pickin’ Day. Problem is, once we got past the point of the pig being ready, I never had the chance to take any more pictures. I had missed the opportunity. Ugh. But, I knew that the following weekend, my brother was scheduled to cook not one but, TWO pigs for our local Arts Council fundraising event. I still had a chance to get the photos and create the recipe and step-by-step photos in time for National Pig Pickin’ Day. But wait, pretty much the same thing happened again. It was just my brother and myself this time, Wren was at his full time job and again, once the pig came off the grill, there wasn’t time to take pictures. I had missed my second and final chance to get something up BEFORE National Pig Pickin’ Day. That brings us to this picture. This past Saturday morning, just after midnight, I was back at my brothers house as we removed yet another pig from cold storage and placed it on one of the Carolina Pig Cooker grills. It seems all of my pictures of placing a pig on the grill have been made with flash… in the dark. The pictures turned out OK, it’s just not much to look at. Pig looks better once it’s all cooked so I’m going to spare you, for now, on seeing the pig just after it went on the grill. We were cooking THIS PIG for National Pig Pickin’ Day. It had to be ready by 10:00am because we would start serving at 12:00noon. It was about 2:00am Saturday morning before I got home and into bed and, 5:30am when the alarm clock went off to get back up. Somehow, we just don’t get any sleep when it’s time to cook pig. It was just going to be me and my brother again this time and, we were responsible for getting everything ready by noon serving time. So, we met at the auction house about 8:30am on Saturday morning, set the tent and tables up and jumped right in on prepping the food to be served. We might have been about 5 minutes late in getting our first plate out but, let me tell you, we started making plates at 12:05pm as the tent was immediately surrounded with folks and we never stopped until an hour later when… we had sold completely out of barbecue. I made plates on one side of a long table and Wanda, wife of the auctioneer, made plates on the other side. We handed those off to Patricia who was taking up tickets and handing out prepared plates along with taking donations for a cup of Banana Pudding. My brother had finished chopping and saucing up the Barbecue and was moving hot pans of food from the cooker to the table about as fast as we were making plates. Every once in awhile I got a chance to sneak a peek at the long line of folks waiting for their plates and, it was nothing but relief when I saw only two folks waiting for plates. That’s when I told Wanda that the old man had to sit down. I don’t know how I had managed to continue to stand up for even that length of time. The legs have given up their youth and being up for more than 10 minutes at a time usually is all I can handle. I can only give thanks to God for the strength to keep pushing out plates. Thank you also to Wanda and Patricia for their help with the serving line, to Charles for holding down the styrofoam hinged lid plates as the wind tried to blow them away and, to Ricky and his son Joseph for allowing us to be on the property of the auction house, slinging BBQ left and right. By now, you may have figured out WHY I only have this one picture of the pig on the cooker. That’s right, once it was ready, there never was time again to get any more pictures. We had the very first Nationa Pig Pickin’ Day fundraiser and, I don’t even have one single picture of our setup, the auction house or anything else to share with you. How could that have possibly happened three times in a row? Since we were all donating our time to Family Promise, we did manage to raise a little money for them and, hopefully a little awareness of the program with those that purchased plates. We had a good time but we were all exhausted once again by the time it got around to cleaning everything up, afterall, there was an auction coming up just a few hours away. Thank you to everyone that stopped by for a plate and again for your compliments on the food. We do hope you enjoyed it. Thank you very much to Ricky, Wanda and Joseph at R&W Auctions for hosting the very first, officially sanctioned, “National Pig Pickin’ Day” Event… ever held in the entire world. We truly made history on May 18th and I promise, good Lord willing, we’ll do much bigger and better next year. We knew we had to start somewhere and we can’t wait to see where we’re going.